It’s been 20 days since the launch of MFC and we have noticed a considerable interest in MFCoin due to a constantly increasing number of wallets. At the same time, new miners with powerful computers started their performance in the web and, therefore, got most awards for the mined blocks. 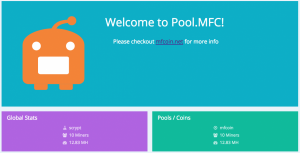 To resolve this issue and let everyone mine the coins, MFCoin has launched an official mining pool at http://pool.mfcoin.net which gives the opportunity to mine coins conjointly even while working on low-capacity machines. Setting requirements for working with the pool can be found in the Help section. Later on, we will also upload a detailed manual on the matter. We also suggest that you write your instruction in Russian and in English for a bonus in the amount of 60 MFC per one system. In any case, feel free to give us your feedback on how you managed to tune the software and the equipment and got the reward.